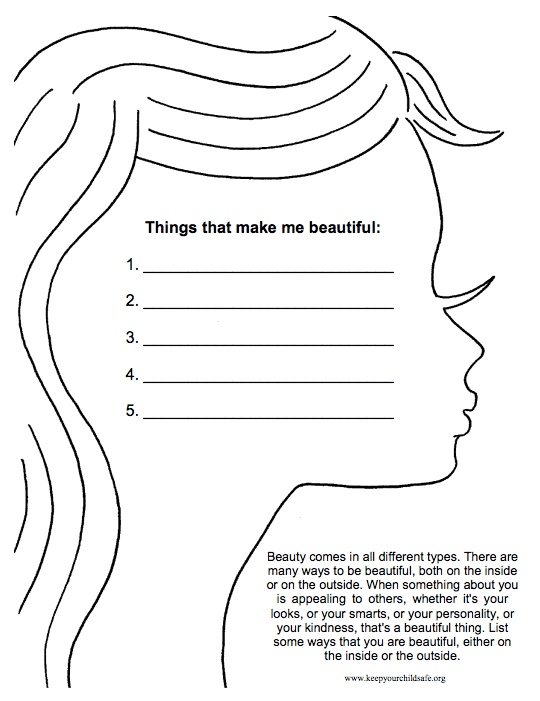 We’ll provide several methods and activities for building self-esteem, starting with self-esteem worksheets for young children and ending with self-esteem worksheets for adults. Primary or elementary school is such a fantastic time to start helping your child develop self-esteem if you haven’t already begun. Children’s minds are generally so much more flexible and open than adult minds, making it the perfect opportunity to begin planting the seeds of a healthy self-esteem. 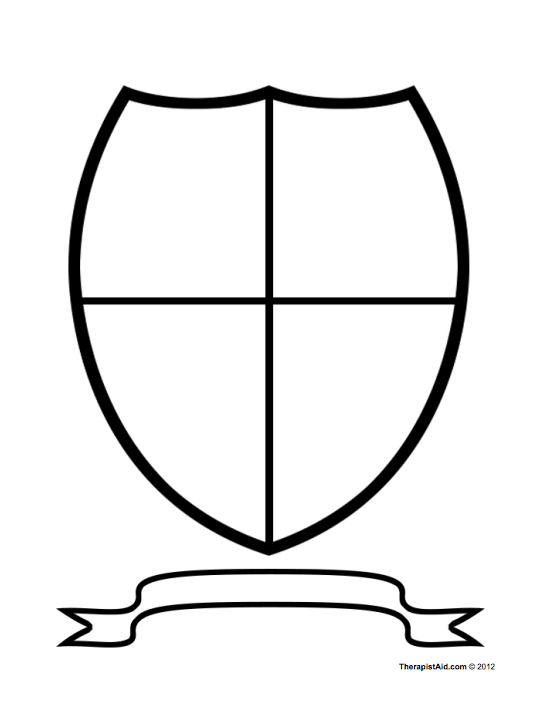 Click here to download the worksheet and give it a try. Click here to try this worksheet for yourself. 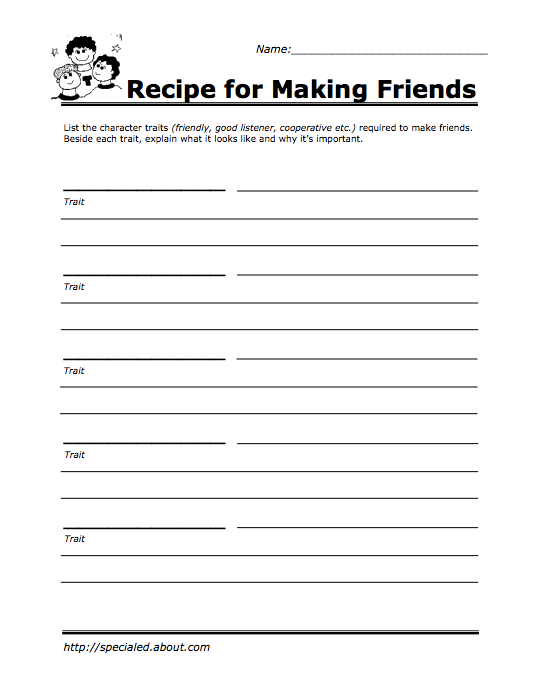 Click here to download this worksheet and help your child learn how to both find and be a good friend. Follow this link to download and use this worksheet with your child. You can access the worksheet here. To see this worksheet yourself or download it for your teen or adolescent, click here. You can find this worksheet here. 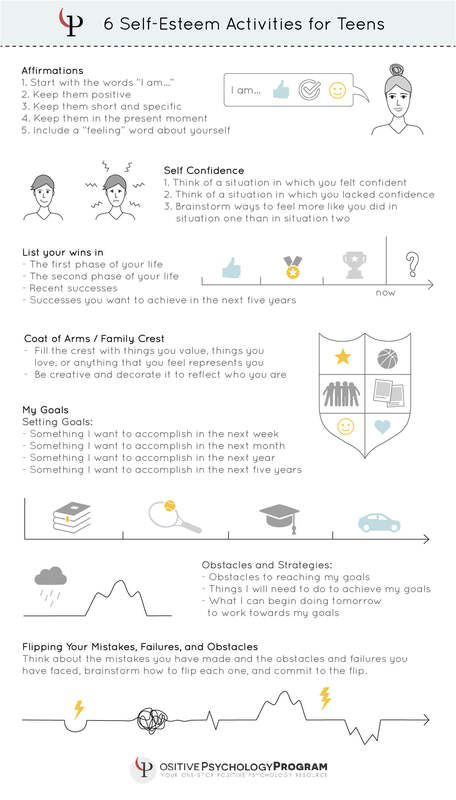 For a more detailed goal planning exercise, you can try this worksheet. It allows your teenager or adolescent to focus on one goal area in particular, and dive a little deeper into their planning for each milestone. To download this worksheet for your child, click here. 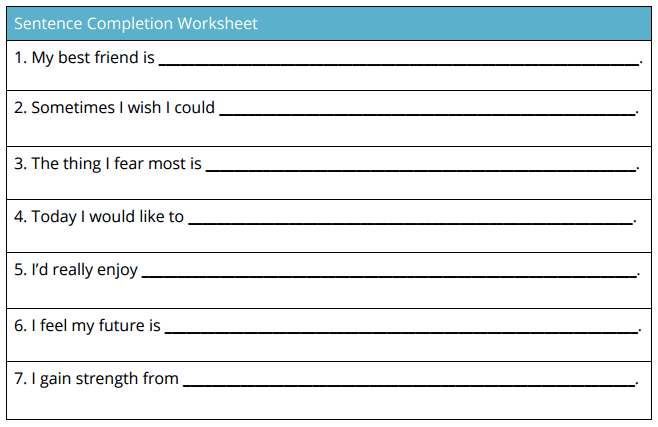 This worksheet leads the reader through a sentence completion exercise for adults. This exercise is exactly what it sounds like: it includes prompts with blank space at the end for you to complete the sentence in the way that feels right to you. If you’d like to see other tips for therapists in administering this worksheet or give it a try yourself, you can find it here. The worksheet begins with a short paragraph on the potential benefits of journaling, including improved self-esteem and well-being. 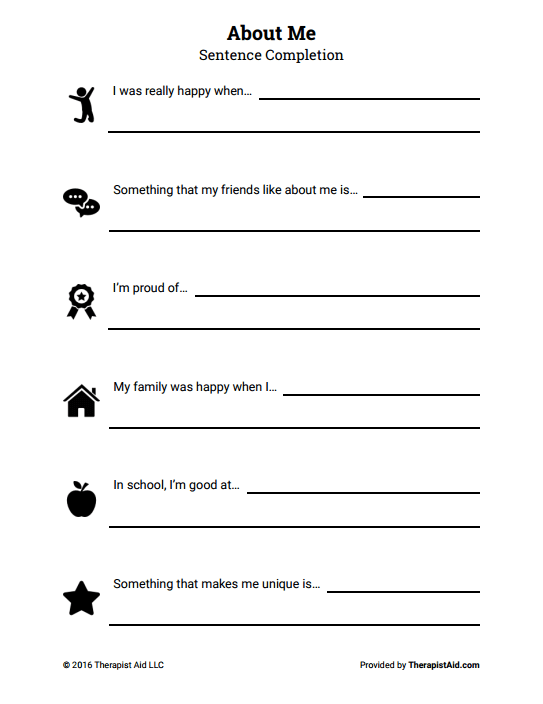 The reader is encouraged to use this template to reflect on the meaningful moments of their day and review the changes in their emotions and general outlook over time. 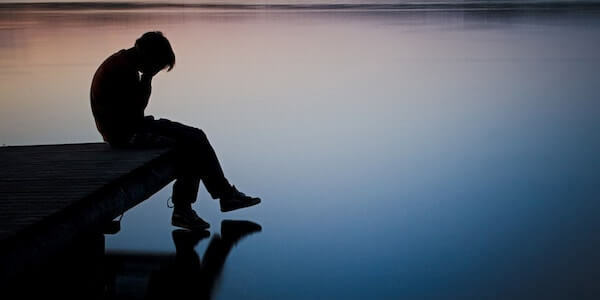 Trigger – in this column, you write down what prompted your negative thought. Maybe you noticed a typo in a paper or report you wrote or caught a glimpse of your reflection when you weren’t looking your best. Whatever it was, think back to the moment the negative thought first popped into your head, and write down whatever immediately preceded it. Click here to view or download this worksheet. Finally, the worksheet presents an opportunity to apply what you have learned from these examples to your own life. You are prompted to identify three negative core beliefs and three reasons that each belief is not true. To give this worksheet a try, follow this link. The worksheet provides space and instructions to record three instances where you have communicated assertively and list the emotions you felt afterward. If you can’t think of an instance where you have communicated assertively, don’t worry! You can make that a goal for yourself in the next week. 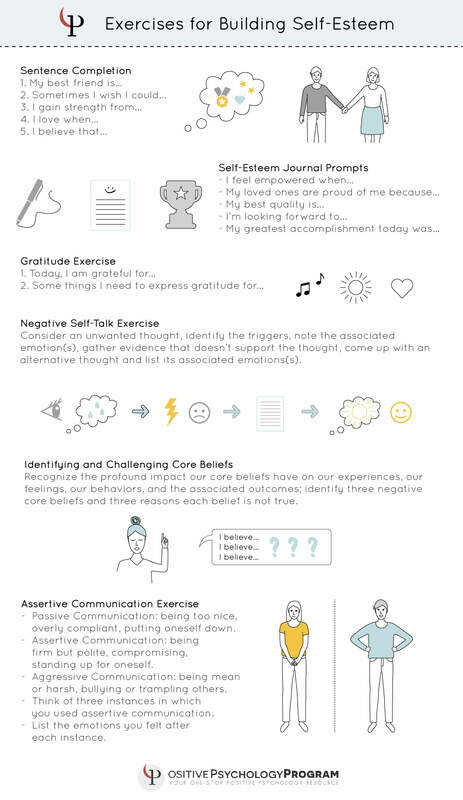 To see this worksheet for yourself and begin building up your communication skills, click here. 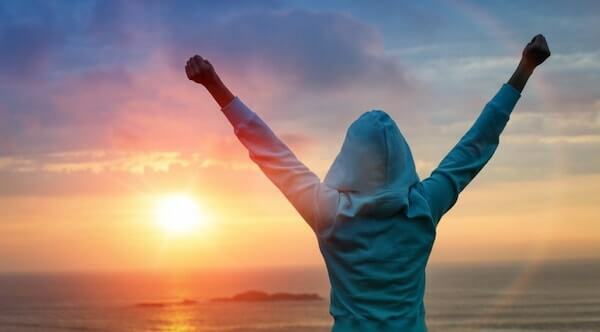 To read these tips in more detail, you can visit Edberg’s blog post on improving self-esteem here and read more about positive body image here. This book will guide the reader through identifying the causes of low self-esteem and activities and exercises to start improving self-esteem. It’s written in plain English, not psychiatric jargon, and enjoys an impressive four-star rating on Amazon. Thank you so much for sharing this great compilation of some of the best worksheets to be used with adolescents and adults, at one place. Your write up is an added advantage for better understanding to use it! This is an eye opener and will help me to assess myself and teach my children at the same time. Thanks for sharing such a useful information.It is very helpful in self development.Waiting for more one. Hi there, I was just wondering if your pdf’s are available in French? This is life changing! These worksheets helped my anxious, adopted daughter and her friends emmensly!!! thanks for this beautiful write up. i have just begun field as an intern where i deal with passive and withdrawn kids. looking forward to make the best out of this guidance! thanks you loads for sharing this good write-up. i have just begun my field as an intern where i deal with passive and withdrawn kids. looking forward to help them with this guidance! Thank your for this great resource. I will use some of these tools during activities. Great tool for working with teens. Wow I really needed this. I just started working with teens who have low self esteem and looking to gain more confidence. Thanks for being unselfish and sharing such amazing information. Thank you for this incredible resource. 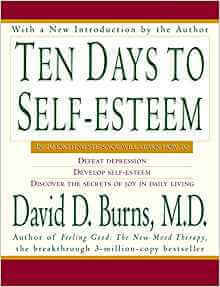 I work with young teen girls who suffer greatly from low self-esteem as I did when I was young. I am constantly looking for activities they can use to get them out of their emotional state…tools…new tools. Thank you. That’s so great to hear, Aida! Thanks for your comment.